Stem. - Stout and tall, two to twelve feet high, often dotted. Leaves. - In whorls of three to six, oblong or oval, pointed, rough, veiny, toothed. Flower-heads. - Purplish-pink, small, composed entirely of tubular blossoms, with long protruding styles, growing in large clusters at or near the summit of the stem. The summer is nearly over when the tall, conspicuous Joe-Pye-weed begins to tinge with "crushed raspberry" the lowlands through which we pass. In parts of the country it is nearly as common as the golden-rods and asters which appear at about the same season. With the deep purple of the iron-weed it gives variety to the intense hues which herald the coming of autumn. 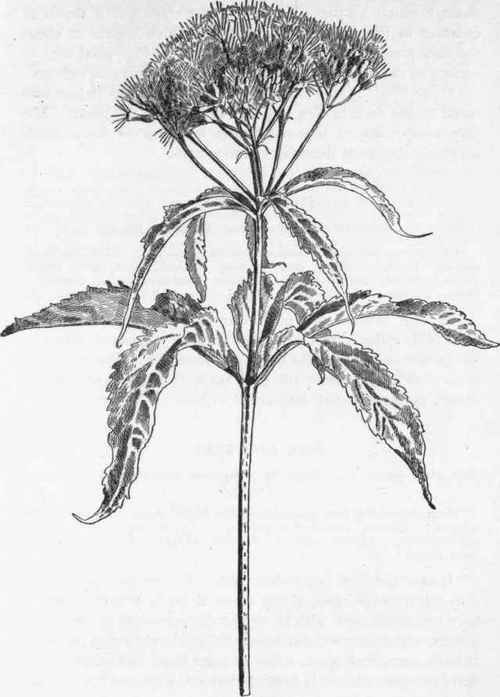 "Joe Pye" is said to have been the name of an Indian who cured typhus fever in New England by means of this plant. The tiny trumpet-shaped blossoms which make up the flower-heads may have suggested the other common name.